Hello and Welcome to The Hanzon Foundation website! We are thrilled to launch our Foundation and we thank you for joining us on this journey. As the Director of The Hanzon Foundation, I will be posting a monthly blog which will highlight any news or updates about the Foundation. Recently, I was sitting with Lonnie and Terry and we were reading cards written by members of the Slater Elementary Art Club. I had displayed some pieces From the Chest series at Slater as well as information about Lonnie, Hanzon Studios, and his local public art pieces. Then I gave a presentation at an Art Club meeting where we looked at more of Lonnie's art, watched a short video, and attempted to draw using our left or non-dominant hands and our eyes closed - the same way Lonnie began the images you can see in the From the Chest series. Once we finished, the students were able to write cards to Lonnie, asking questions and commenting on his art. Overall it was a fun, challenging, and exciting experience and one which we hope to bring to other local schools as part of our educational outreach. Many of the students asked about how Lonnie was able to draw with his opposite hand and where his ideas for his art come from. One student hoped that Lonnie could decorate his Mom's car and another asked what it was like to be famous! Watching these students explore Lonnie's art and learn about him as an artist reminded me that art is one of the greatest communicators. Each student, in a small window of time, felt the joy of seeing imagery that spurred their imaginations, experienced the emotion of color and line, suffered the struggle of trying something new, and because of art, felt a connection to someone they had never met. When I returned at a later date with Lonnie's replies, the students were ecstatic to receive an answer to their questions and to have something so special, just for them. We hope that The Foundation will always bring that amount of joy into the world. Through our outreach and future projects, we strive to communicate, educate, and share the lessons learned by Lonnie and Terry. I have been lucky enough to be a lifelong spectator of Lonnie's creativity, he and Terry's wonderful relationship, and the legacy they hope to leave behind. This is really the foundation of the Foundation! Every epic journey begins somewhere and I am excited to see what path lays before us. 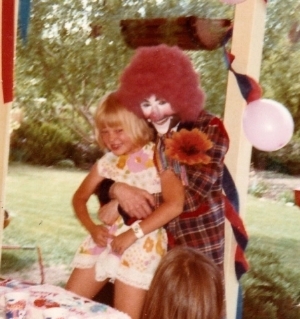 Lonnie the clown & me the birthday girl!